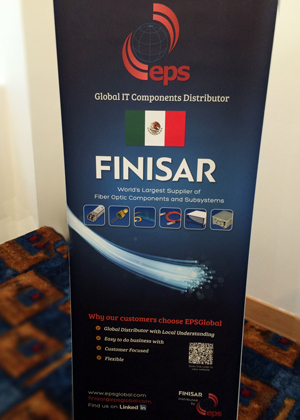 The Finisar Mexico seminar on EMERGING OPTICAL TECHNOLOGY AND APPLICATIONS for DATA COMMUNICATIONS AND TELECOMMUNICATIONS was a big success. Everest and EPS held two seminars; one in Guadalajara and one in Mexico City on 21 April, 2015. Christian Urrcariet and Ken Garret from Finisar lead the seminars. Mr. Urrcariet is an industry leader in data communications transmission product solutions. Mr. Garret addressed telecom applications and directions. The seminar included an Introduction and Industry update on optics in the data center and Finisar capabilities update. Optics for data center/communications solutions was presented. Including Intra-Rack 10G – & SFP Wire, Inter-Rack 10G-40G- 100G & Active Optical Cables, and Long Span/Inter Building 10G- 100G. Telecommunications applications direction was also addressed; touching on SDN and NFV Impact. In addition Transmission Applications was discussed with an overview of 10G to 400G, tunable transceivers, and transport. ROADMS in telecom and the data center was also shared. Everest Sales and Solutions extends a big thank you to Finisar and our Everest team for their always excellent work presenting this technical seminar.